Thursday, May 24, 2018, at 7:30 p.m. Rabbi Ed Feinstein is the author of several books and is the senior rabbi of Valley Beth Shalom in Encino, California. He serves on the faculty of the Ziegler Rabbinical School of the American Jewish University, the Wexner Heritage Program, the Shalom Hartman Institute in Jerusalem, and lectures widely across the United States. Admission is free and open to the community. A Dessert reception follows the lecture. 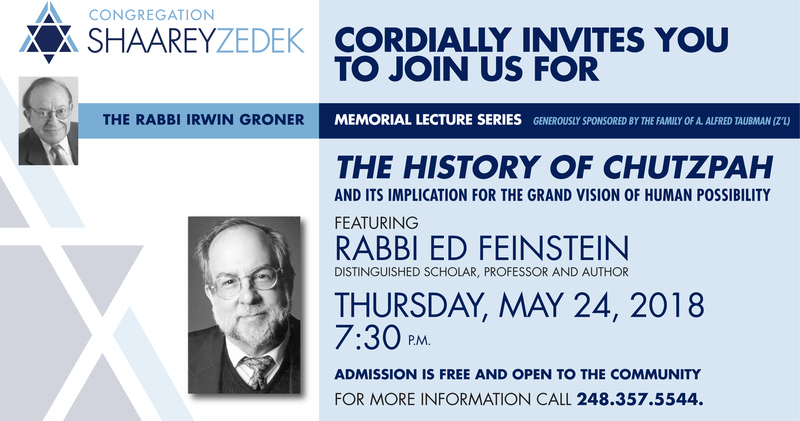 For more information, contact the Synagogue office at 248.357.5544. Generously sponsored by the family of A. Alfred Taubman (z’l).